Συναρπαστικό άρθρο. Γεμάτο πληροφορίες, φλογερό πάθος και υποστηριζόμενη από ένα πολύ βαρύ βιογραφικό άποψη. Υπέροχο! Το διάβασα και θέλησα να το μοιραστώ μαζί σας. 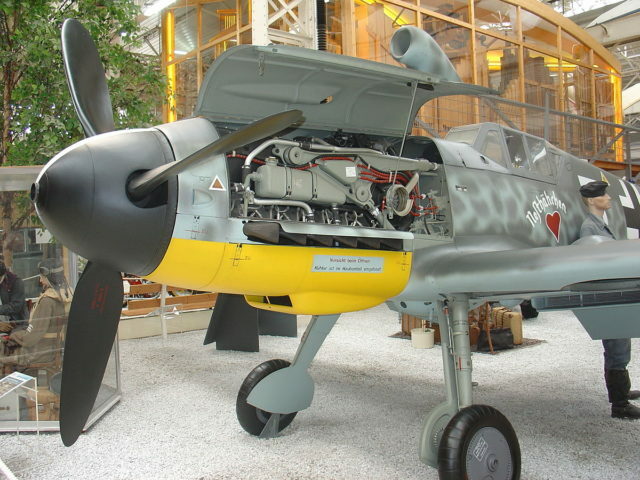 Το Messerschmitt Bf109 με serial number #19310 στο Technikmuseum Speyer. Εμφανής ο V12 κινητήρας της Daimler-Benz. It was a most unexpected phone call that shook me out of my well organized aviation life. Mike Spalding, chief pilot at the Fighter Factory and friend, had warned me a year ago that the museums newly restored Bf109G would be done soon, and since I had recent Bf109E experience, I would be called to help check him out when it arrived. But today’s call contained far more intrigue. The Fighter Factory was holding its annual air show in one week, the Bf109 had arrived late, and no one was trained yet to fly it in the show. Would I like to fly it? I can think of no other aircraft in the history of the world that elicits a wider range of strong emotions in all who are exposed to its character. The Spitfire, you say? It is full of resourcefulness, love, passion, and grace. The “Spit” is indeed much more than the sum of its parts, like the Bf109. But without any challenging traits, it is as German Aces have declared, an impossibly simple kiddie toy. It has no way of biting you. When the novice Spitfire pilot has applied too much brake on the ground, the tail comes up so slowly that they have time to wind their watch and tear up their pilot license before flipping the switches off to save their prop and reputation. This limits the Spitfire’s ceiling of respect. It has the soul of a kind being, reluctant but capable in the hunt. It places no more demands on a pilot than an ice cream cone. The Bf109, in comparison, drains blood from all whom it touches. It makes no Messerschmitt Bf109G design compromise to coddle toddler pilots. It demands the very best performance from the very best pilots and charges the ultimate price for inattention. When the Bf109’s many idiosyncrasies were embraced and utilized by “Experten”, it forever became the Darth Vader of aviation. Those who have witnessed the aircraft’s soul experience the same eerie feeling prompted by lines in “The Terminator” motion picture: “ It can’t be reasoned with. It can’t be bargained with. It doesn’t feel pity of remorse or fear, and it absolutely will not stop. Ever. Until you are dead.” Such were my thoughts as I arrived at Jerry Yagen’s magnificent Fighter Factory in Virginia Beach, test cards in hand. After 3 flights to sort out the newly restored Bf109G4, it is my obligation to provide a window into the character of this weapon in a way that both aviators and non-aviators can relate to. My brief history: Unlimited category aerobatic competition in Pitts and Sukhoi, followed by many years of air show flying, with over 20,000 lomcevaks and related maneuvers from every possible condition of flight. I have also been lucky enough to fly years of surface level aerobatic solos in a Spitfire Mark IX, an air show dogfight demo in a Messerschmitt Bf109E versus a Hurricane, a solo Hurricane demo, and finally, extreme air show flying in my own North American Harvard, replete with tail-slides, avalanches, rolling turns, hammerheads, etc. I am stimulated by finding ways to make aircraft fly at the edge of their envelope. With the tiny number of airworthy Bf109’s and an almost equally small number of pilots under the age of 90 who are qualified in them, I bring a perspective that is slightly different than that from the average test pilot. Let me give you my impressions. The Bf109G “Black 1” has angular sharp lines, and a beauty created when form follows function. This beauty belies great underlying strength. Open any compartment or cowl and your impression is of precise fit and finish. How did engineers achieve such mechanical perfection? With each layer of outer protection removed, there is a denser, stronger, layer beneath. The wings are small. The tail is tiny. Yet the aircraft is built around the massive DB605 masterpiece of an engine as if its creators had vacuum formed every part, so as not to allow 1 mm of space to enlarge the final product. This aircraft is significantly smaller than other contemporary fighters. Think of an armored Extra 300 with 1500 hp., or a Mako shark crossed with a stiletto, painted in shades of grey and black. The dark soul of this aircraft would turn any other paint scheme black in one flight. In comparison, shark tooth paint schemes of other fighters are merely aircraft codpieces for the poseurs within. Entering the cockpit is similar to putting on a bespoke suit. The fit and ergonomics are way ahead of the time. The seating area seems to have a perfect human size shape carved out of a steel ingot. At 1.8 m and 87 kg, this aircraft is a perfect fit. The pilot never has to brace to prevent body movement during maneuvers. Feet are raised. Knees are raised. Seat is reclined. The geometry of the 4-point seat belt attachment is perfect for emergency negative G flight. Get ready to laugh at G forces. Let all the Spitfire pilots burst their blood vessels straining in their upright seats. Did you think this anti-G posture was invented with the F16? As you visualize your flight and go through all of the usual procedures, close your eyes and imagine where something should be at each step. Reach out and touch. Open your eyes now. That is exactly where it is. The E model has a busy workload with manual oil cooler doors, manual radiator doors, manual propeller pitch and a stiff T handle for landing gear retraction that requires the same wrist movement as pulling a tooth. The G model has drastically reduced workload and effort. There are little push buttons for selecting landing gear, automatic oil cooler doors, automatic radiator flaps, and finally, automatic propeller pitch control that works. There is no need for a mixture control. The stick design is of perfect angle and length. There is no friction of any kind in the flight controls. The rudder pedals copy and contain the exact shape of the foot, so that in negative G flight, you are still in the game. The canopy is small and full of vision blocking metal between panes but the pilot’s head is so close to the glass that he can see down and around much better than expected. You will need to be able to do 20 kg dumbbell presses to move the canopy up and down. Of course, this is expected of pilots who also possess the strength of character needed to satisfy this aircraft. Taxiing the airplane is easy. Blasts of power with frequent stabs of brake are needed to initiate turns, with no risk of the heavy tail coming up. In less than ten minutes, you must either take off or shutdown, due to rising radiator temps. Bf109 take-off drama is the stuff of nightmares. Everything you have ever heard is true. German aces all experienced loss of control accidents. Recent test pilots have not been immune either. Everyone will be challenged to the limits of their ability sooner or later. I thank German ace Oskar Boesch for giving me my Bf109E check out. Despite this preparation, the Bf109 has at times required everything in my playbook all in one moment, to keep under control. I treat this aircraft as a priceless jewel, changing all parameters of use to limit risk. Never use hard runways. Never accept more than a 10 knot crosswind on grass. Never use runways with any obstructions anywhere in sight. Does this sound too restrictive? Running off the runway should involve embarrassment, not injury. The pilot must respect the constraints of a design that permitted the wingless fuselage to be rolled into a rail car. Poor ground handling traits are only partly caused by the narrow wheel track. The extreme tipped outward angle of the wheels as they meet the ground is what instigates most excursions off of the runway. If any more weight is placed on one main wheel than the other, that wheel gets enough traction to turn the plane to the other side. Every bump, crosswind, and the rotational torque from any power change makes this craft carve a turn like a toy wheel rolled while leaning to one side. You are not given the immediate yaw in one place that other tail wheel airplanes experience unless you try to land on a hard runway. Watching a Bf109 take off on grass from behind sheds much light. Once the tail comes up, the aircraft yaws to the side by 10 degrees. Each tire struggles for dominance over the other. Grass is thrown out in little rooster tails. Imagine each wheel as a heavyweight boxer in a title fight, with you as the undersized referee, too weak to guarantee complete control. To stop a divergent arcing turn, there is at your disposal one tiny rudder optimized for high-speed flight and brakes that were designed to taxi on 1000m square fields. Ground stability is further degraded by the high center of mass of the engine and the overpowering gyroscopic behavior of the propeller. Raising the tail fast gives such a large yaw to the left that the small rudder is unable to compensate. Oskar Boesch felt the most important information for me to learn was first, the correct rate of throttle movement from idle until tail raise, and second, the ideal rate of moving the control stick forward to raise the tail into the exact flight attitude. Huge increases in safety would come from that discipline alone. He put his hand on mine and rehearsed the exact speed of all control movements, imagining a glass of champagne sitting undisturbed on the panel through the entire takeoff roll. The Bf109 rudder must be frenetically moved to maintain heading on takeoff, never allowing the aircraft to diverge. It has been said that if the direction of take-off roll is allowed to change, one must not try to correct, but instead accept the new heading until off the ground. Attempts to correct with strong opposite rudder result in such severe oversteer, that the ensuing high-speed ground loop toward the other direction could be deadly. Can you see how this is unlikely to work on a narrow runway with trees on each side? A Bf109 always skips a few times before starting to fly, as it must be convinced of your competence again and again before finally handing over the reins of control. Once airborne, acceleration and climb angle are extreme, and combined with runaway freight train acceleration downhill, this fighter plays the energy card better than most. The stick forces used in pulling out of a fast dive remind that German pilots were naturally assumed to be strong. Pilots are advised not to use trim to compensate. The E model has a lightning fast roll rate and response at slower speeds, but stiffens up to match the competitors from cruise speed and up. The G is slower in roll than the E, but varies less with speed change. Roll performance in the G is similar to the Spitfire Mark IX, but feels better at high speeds. Fluid yaw stability is a shared trait of all the Bf109 series. It wants to be told what to do with the rudders every second and it delivers instantly, giving opportunity to yaw with minimal drag for a deflection shot or to provide subterfuge and evasion. Precise controls feel hand made and adjusted like a fine watch. Move anything one mm, and you will get exactly one mm of aircraft movement, with no slop or delay. There is the feeling of enough airframe rigidity and strength to fly through a tornado unscathed. Controls for radiator and propeller are switched into automatic once gear and flaps are retracted. All that is left is a desire to hunt. Wing loading is high, even for a WW2 fighter. Leading edge slats automatically drift out during increased angles of attack to mimic a larger wing. It works brilliantly. On paper, the Bf109 should not be able to stay with a Spitfire in a turn. In the real world, half of the German aces claimed they were always able to stay with Spitfires and Hurricanes in turns. How is this possible? The Bf109 accelerated stall behavior was far more benign than its competitors, allowing pilots to play at the edge of control without penalty. At any speed and G load, slight relaxation of the stick instantly returned the stalled wing to normal flight. Lesser aircraft could not risk flying at the edges of their superior theoretical performance without losing more control than the Bf109. Landing the Bf109G brings you into the final of this challenge match. Longitudinal stability and speed control befitting a DC3, combined with a steep nose down attitude and great visibility lull you into a false sense of security. The E model droops the ailerons as full flaps are rolled in, making roll response very heavy and approaches at 140kph. The G model needs 180 km/hr across the numbers to smoothly flare and land in a 3 point attitude, arriving like a clod of dirt. This plane sits down very well and suggests to you it does not feel like flying any more. Rollouts are short. I flew an E model out of an 800 meter grass strip with a 15 meter obstruction at the approach end without any problems. The Bf109 usually rolls straight after touchdown, but sometimes careens and arcs wildly off on a new direction as if you jumped onto a curving railroad track. Landing gear geometry, combined with high motor CG, aft longitudinal CG, and ineffective rudder, can demand occasional strong brake use to keep rolling straight. In comparison, take offs are far more traumatic. Aces said that if you survived the takeoff, you would likely survive the landing. Most pilots get out of the cockpit after a successful flight with a sheepish look on their face. They would look the same if a semi-truck ran a red light at 100kph and just missed them. Listen to a Merlin engine and hear a beautiful symphonic sound. Listen to the Daimler Benz engine. The recipe for recreating this sound is to start with a Merlin. Put in a racing camshaft, jack up the compression, and then garnish with the shriek of 1000 tortured souls that is the DB605 supercharger. It is simply the most pure and sinister sound in the universe. Being attacked by something with this sound would make me curl up in the fetal position on the floor and cry like a little baby. Any exposure to this instrument of war will permeate your soul and imprint itself there forever. It moves a person like nothing else. Non-aviation people who stumble upon it at an air show can be talkative and laughing around all the rest of the aircraft, but when they lay eyes on the 109, all go quiet, not knowing but feeling this unstoppable force that is the Bf109G. Witness the Bf109G. You will forever regard it with more reverence and respect than any other man made object. Το άρθρο δημοσιεύτηκε στο Νεοζηλανδέζικο Classic Wings Magazine στις αρχές του 2017.